Jeff Cable's Blog: Swimming action! 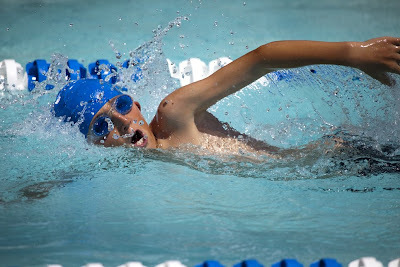 Saturday was the first swim meet for our swim club and the kids did great. It was also a good time to capture some images of the kids in action. This is the first time that I have used the Canon 5D Mark II for sports and it came through nicely. At only 3.5 frames per second, it is not the fastest camera out there, but it takes a hell of a picture. Since I have shot many of these swim meets, I tried to find some new angles and new images to capture on Saturday. I tried to shoot at times that I would normally not hit the shutter release. 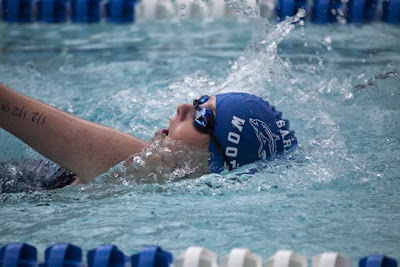 This gave me some cool images of the nontraditional swim team shots. And then after trying new angles and action shots, I decided to put that new Sigma fish eye lens to work once again. This gave me some totally different perspectives of the meet. After shooting thousands of shots of the swimmers, I had never had a shot showing the timers doing their job. 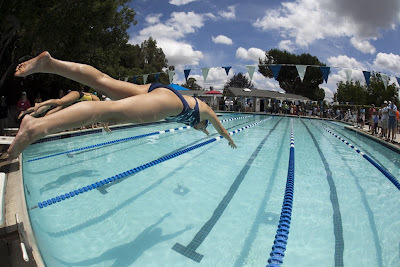 The fish eye lens provided a very cool image of the swimmer coming to the wall with the timers ready to record the race. Damn - this lens is cool! Having fun with photography! - "Midnight snack"